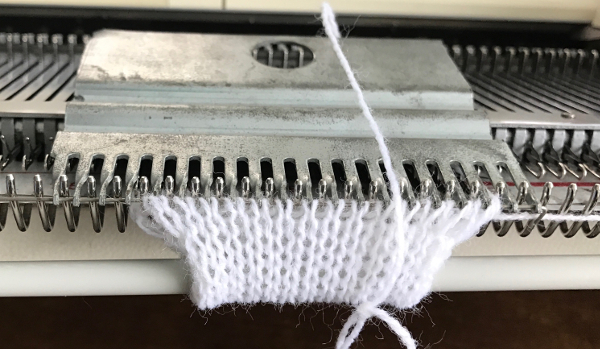 My first encounter using a ribber cast on comb for open edge single bed knitting was in using the Passap machine. 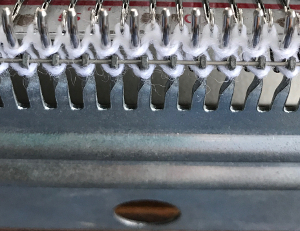 Its use for this purpose is possible on other brands as well. 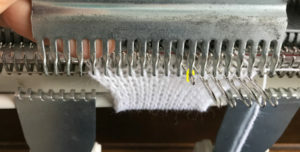 It provides an easy way to deal with waste yarn and weight application on ribbed fabrics. I like using ribber cast on combs when knitting single bed to distribute weight evenly across pieces if needed. A second comb may be inserted as knitting grows. Weights may then be removed and moved up, and so on. 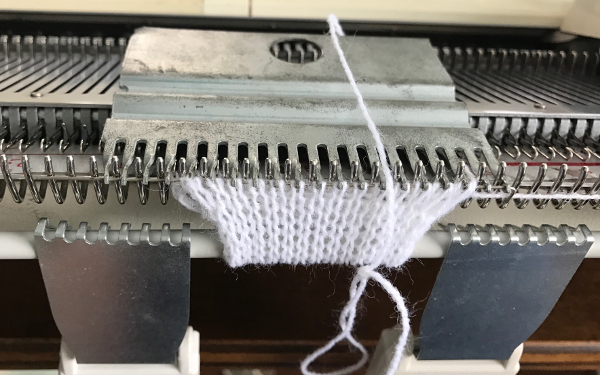 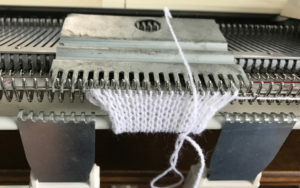 Unevenly distributing weight causes elongated stitches in those areas, and makes shaped knitting unpredictable unless the ratio of weight to width of knitting is maintained. 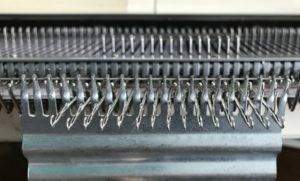 Here the topic is using the ribber comb in single bed open cast on and hanging hems. 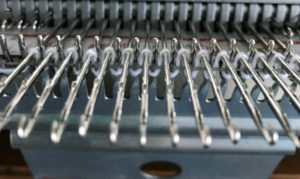 My Japanese machines are used chiefly for production of single bed items, so usually they are ribber free. Balancing the ribber on older KMs can be fussy, so once the ribber is up, working, and well balanced, my recommendation is to leave it in place if it is going to be used on a regular basis. 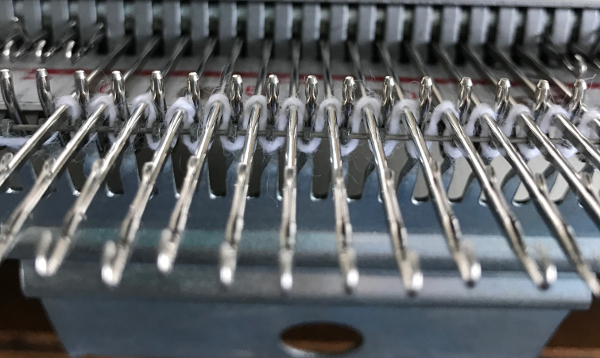 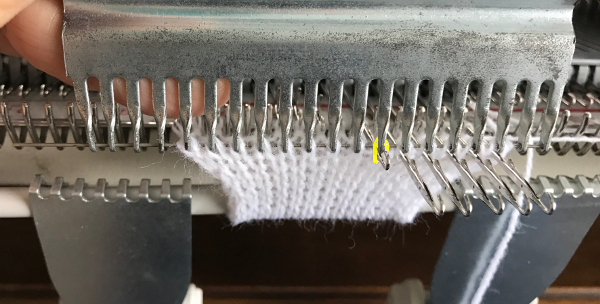 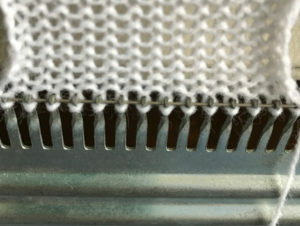 For this technique use a cast on comb appropriate for your knitting machine’s gauge ie 4.5mm, 5mm, etc., brand is not relevant, only tooth spacing is. 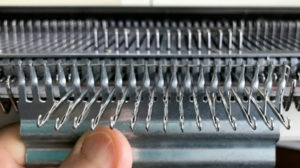 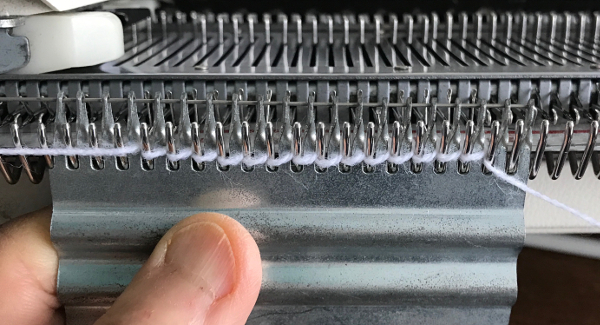 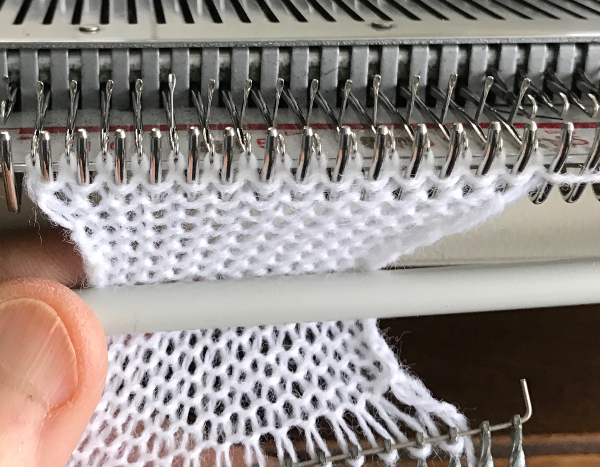 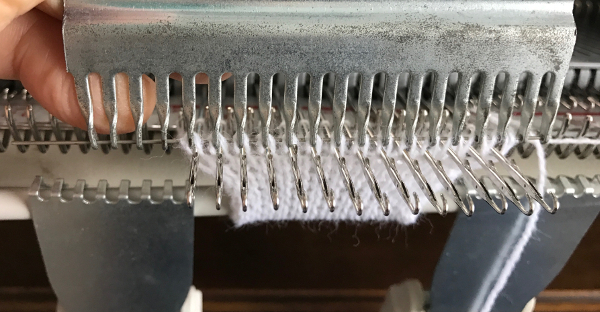 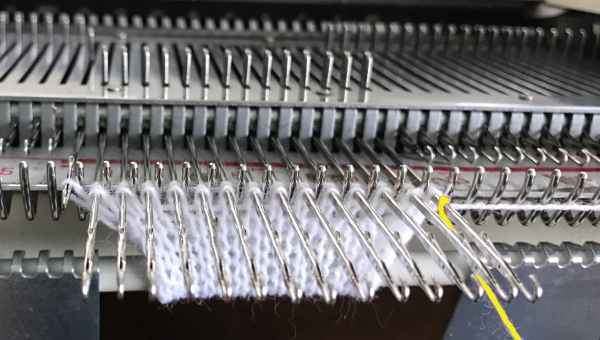 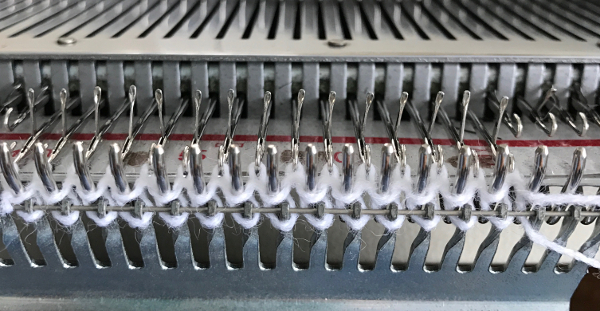 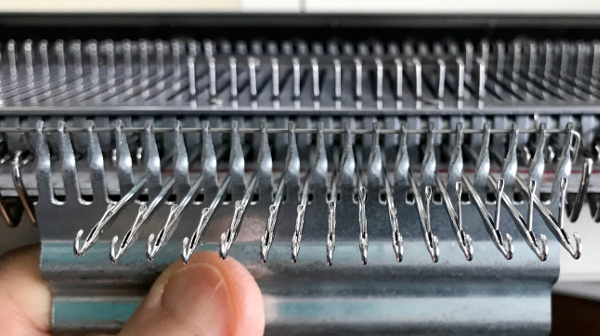 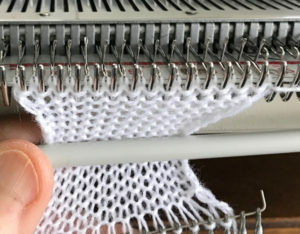 It is possible to cut ribber cast on combs into different widths for use when knitting is planned on fewer stitches than those accommodated by their available commercial widths. 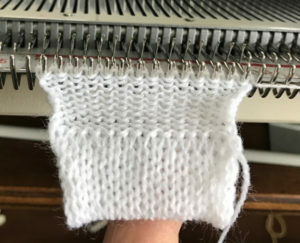 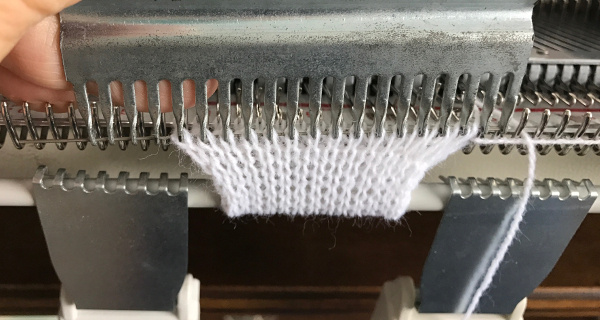 In the yarn used in my swatches, I found knitting the first row at stocking stitch tension created large enough stitches for later picking up and hanging the hem. 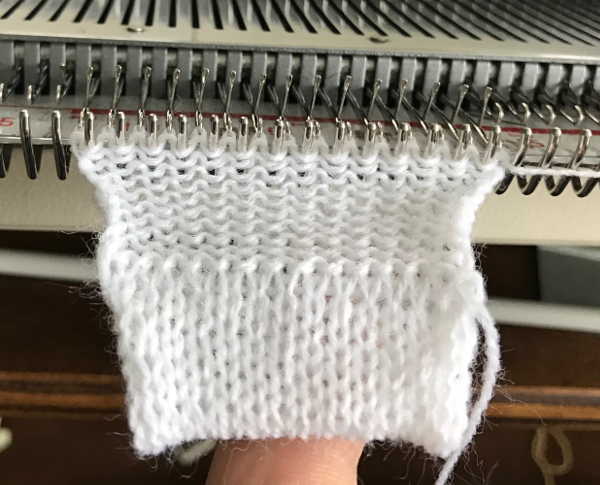 Test your yarn, if necessary use a looser tension for the “cast on” row, and evaluate any inside hem “drop” if looser stitch size is used. 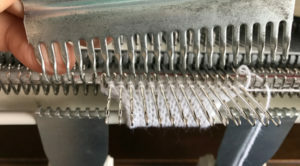 Remove wire from comb. 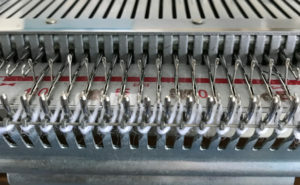 Bring the comb up and between needles to be used, and re insert wire. 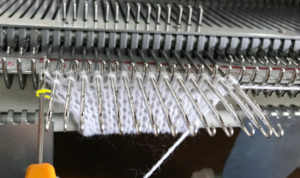 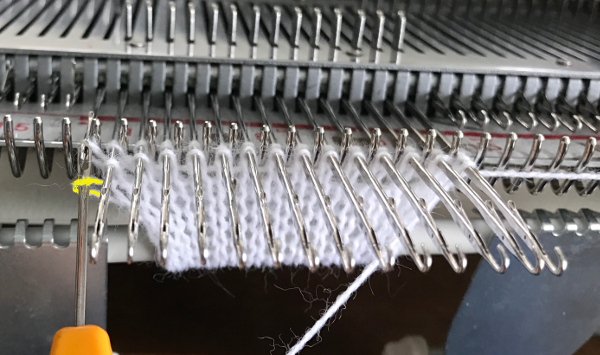 Needles and latches will need to travel easily under the wire when the first knit row takes place. 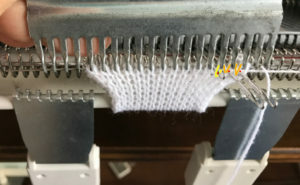 To achieve joining hems in this manner with the ribber in place, though possible on both beds, it is quickest to cast on the back bed (Passap) or on the knit bed (Brother, etc.). 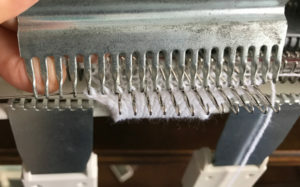 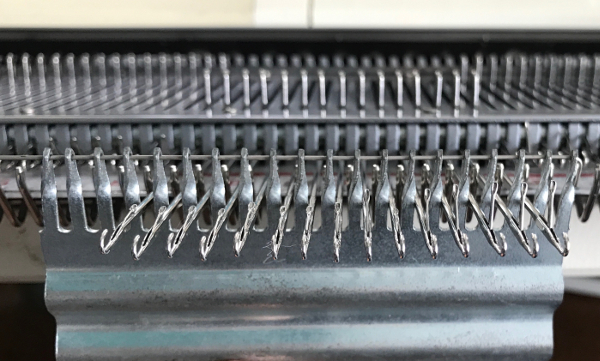 Hold the appropriate ribber comb with the bump(s) up facing you, so that the teeth line up as shown above, with the flow combs/ gate pegs, and the needled can come through the gaps. Leave the wire in, hold the bump(s) against the front bed/ ribber, and tilts the comb against the back/ knit bed. 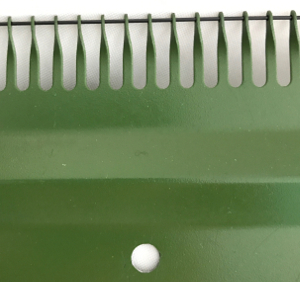 Hold the comb high enough to take the lock or carriage across. 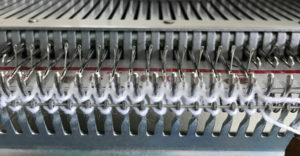 Take the locks / carriages across to opposite side, drop the comb and weigh it, knit 2 rows on Passap before using strippers. 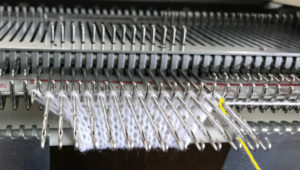 In Japanese kms drop the ribber, switch sinker plates, and continue to knit on the main bed.